I do not understand January the British way. Cards all had to be sent by December 25, decorations must go down 12 days after Christmas and as soon as you hit the first day of the year, it’s all about detox (alcohol included). The French, in comparison, focus on a cheerful note. Good wishes can be sent until the end of January and we go straight for the galette des rois or King’s cake and well, probably a sparkling wine to go with it. This buttery, flaky puff pastry filled with a soft, nutty frangipane centre is traditionally shared with family but also with colleagues. Whoever finds the fève (a ceramic charm) hidden at its heart is Queen or King for the day and, generosity being a royal value, will buy another cake. And so the year starts. In France, the galettes are now on sale from the end of December. When I was a child, though, they were called Galette des dames before the 6th of January. Only from epiphany (today!) 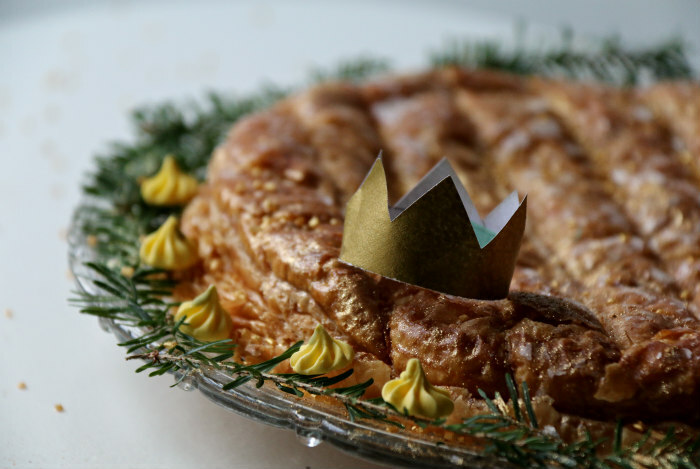 could it be called galette des rois and have a paper crown and a charm. Thanks to Paul, you can celebrate the French way in London too – they will be selling galettes till the end of the month. My kids love it. I promised one for dessert tonight. We add a touch of edible gold powder and sugar pearls to make it even more festive. My son asked whether his favourite fluffy toy could join in so we will have a miniature paper crown, should it be the lucky one. Detox? I say focus on the positive. And cake, my friend, is always a good idea.